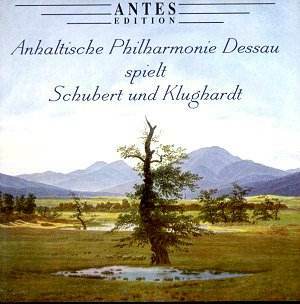 There are now competing versions of Klughardt�s orchestral suite Auf der Wanderschaft. On Sterling CDS-1054-2 it�s coupled with the Konzert-Ouverture Op. 45 (1884), the Konzerstück for Oboe and orchestra Op. 18 (1870) and the Cello Concerto in A minor Op. 59. All are worth getting to know though none is an undiscovered masterpiece. Those recordings were made between 1975-80 and still sound acceptable though not quite as warm as this recent Antes CD, which couples Klughardt�s suite with Schubert�s Third Symphony. Originally written for piano, and premiered by the composer in 1895 to great acclaim, the suite was orchestrated in 1897. A six-movement work, strong on verdant forestry, it has sipped deeply from the Pastoral Symphony and from Schumann and the result is a pleasurable and well-orchestrated example of craftsmanship and melodiousness. The opening movement is genial and rather explicitly Schumannesque and the second, which describes a brook, is animated by constantly running semi-quavers and hints of Smetana. The birdcalls and forest life of An der Klause also contain brief Wagnerian moments (not inappropriately � though not suggestively) and fine lyricism. Klughardt was a generous melodist and this is unfailingly attractive music, even if the cuckoo and hunting motifs and the gruff presentation of the Chase are a mite generic. There�s a Viennese waltz for the fifth movement and in the sixth a recapitulation of melodies and motifs � warm, mellow and at an axis of Beethovenian and Schumannesque. The coupling is in one sense disappointing � not the playing which is attractive enough though lacking in lyrical heft and a certain amount of zest � but because we don�t get more Klughardt. It makes recommendations difficult. I prefer Antes� sound but the Sterling is obviously a better bet for admirers of the composer.